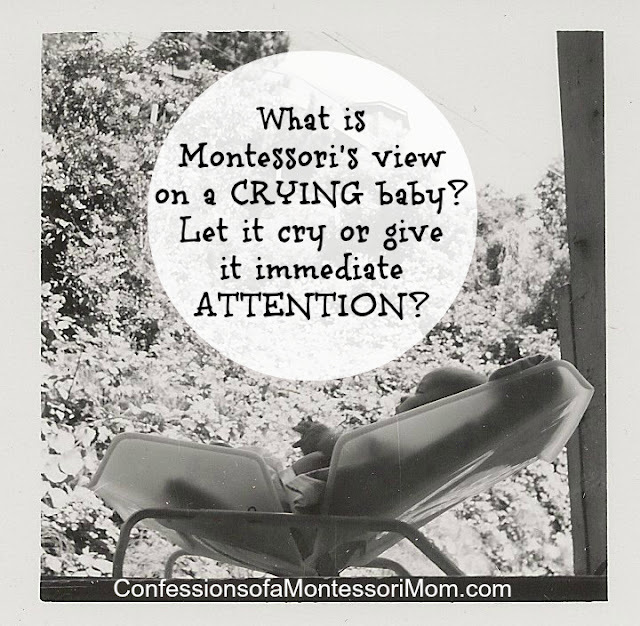 Montessori's view on a CRYING baby: Let it cry or give immediate ATTENTION? I have a three-month-old infant in my daycare who cries when he is not picked up.... His mother said that she lets him cry until he goes to sleep, she does not pick him up, as long as he is fed and dry. What is the Montessori view on this matter? 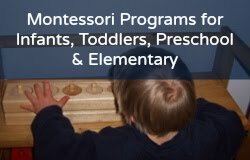 Montessori philosophy supports the concept of allowing infants, toddlers, and preschoolers a time for frustration. That is to say, we should not run to a child's rescue whenever we see him "frustrated" (which is very different than crying!) because we need to allow him time to "work it out" on his own. But this is not the case with a three-month-old infant: they are not crying out of frustration because they are trying to turn over or crawl. It begs the question, should you let a crying baby cry or give it immediate attention? I am not talking about infants and falling sleeping, that is a separate issue! One (old/traditional) school of thought is to not run to it every time it cries (when it is not sleeping). Another is to not let a baby cry and go to it and attend to it. Many studies have been done on infants since Maria Montessori's time, and the old fashioned view of letting a baby cry (or you will spoil it!) is actually harmful. So you need to consider what is developmentally appropriate. If you have the book, Montessori from the Start , by Lillard and Jessen, she discusses crying on pages 223-226 and uses a family with an infant as an example. 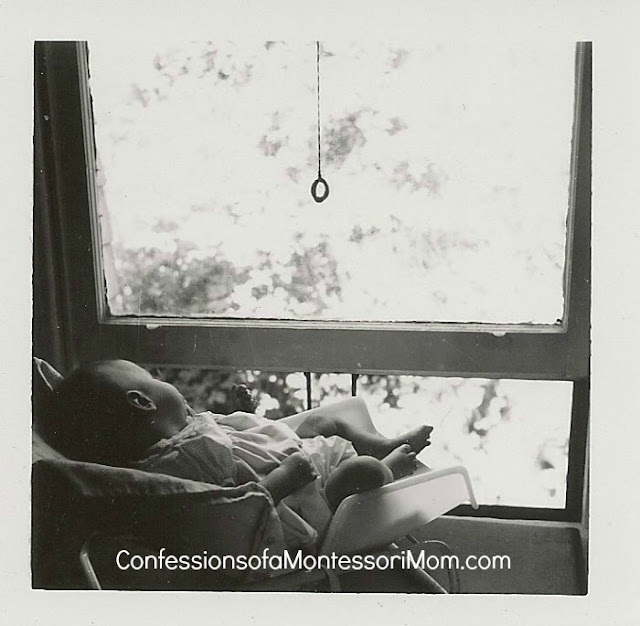 However, it is a very one-sided example and does not apply to all infants, and only supports the book's view (and Montessori's) of having more of a hands-off approach to babies (during play). Instead, I highly recommend the book, The First Twelve Months of Life , by Caplan. His view is opposite of the one described in the Montessori book I mentioned, and it is based on lots of research and studies and experiments. I agree with his view that crying is your baby's first means of social communication and a way of expressing his or her various needs and feelings. "Your baby will cry to let you know that he is lonely, wants attention, and is ready for play. Completely ignoring such cries may cause your infant to develop emotional problems." In support of Montessori, it is important to know what stages of development the infant is in and to use your "power of observation." Let's take three-month-olds for example. They are fascinated with their hands and feet, as well as people's faces (this is one reason they calm down when held). They also love rattles and touching hanging mobiles. I suggest putting "rattle socks" on the infant's hands and or feet to encourage them to explore the hands and feet, as well as a child-proof/baby safe mirror that they can peer into at eye level. I also suggest putting up pictures of peoples faces (happy ones) around the room at eye level so the infant can see them, perhaps cut them out of magazines and tape them on the walls near floor level, changing area, etc. Here are some more tips on three-month olds: they become very social and love to interact with a familiar adult (and get upset when that adult stops interacting with them); they can play for as long as 45 minutes; can see the objects in the room (rather than only in front of them as before); they enjoy "mouthing" objects including their hands (and what they are holding); and they try to explore their face using their hands, as well as try to "clasp" them together. Suggested activities: low hanging mobiles, rattles, rubber rings, toys that squeak. Other needs: "continuity of care" (doing the same things in the same order at the same time each day, as much as possible); affection; a stimulating environment; and repetition. Saying that a crying baby 'just wants attention' makes as much sense as saying 'He just wants food.' They are both real needs. Feed him if he is hungry, and if he is bored do not let him 'cry it out.' Try picking him up and bringing him into the family circle, where he can enjoy its richness.--Caplan. I think Maria Montessori would agree with that!